Born in Bologna in 1890, Giorgio Morandi spent most of his life with his mother and three sisters in an apartment on via Fondazza, where he occupied an austere room used as both a bedroom and studio. Although he has often been envisioned as a solitary and reserved figure, his personal isolation should not be confused with artistic unawareness. From his earliest years, as a student at the Accademia delle Belle Arti in Bologna, Morandi showed an intellectual curiosity that distinguished him from his peers. Through the writings of Roberto Longhi, he discovered 19th century French Masters, such as Seurat and Cezanne, who at that time were often disregarded by Italian institutions; Cezanne’s work was to have a long-lasting influence on the artist. Morandi’s still lifes seem to question both the apparent reality and the viewer’s perception of it, as stated by the artist “nothing is more abstract than reality”. This approach led to an affinity with Futurism and the ‘Pitura Metafisica’ movement (seen mainly in the works of Giorgio de Chirico and Carlo Carrà), that was to manifest in Morandi’s production from 1913 to 1919. Through studying Seurat and his visits to Florence, Morandi was also able to look with a new perspective at the Italian Painters of the 14th and 15th century, such as Giotto, Massaccio and Piero della Francesca. The simple lines, delicate tones, harmonious compositions, flat colours, and the dramatic relation between subject and pictorial matter found in the frescoes in Tuscan churches, reappear in Morandi’s small canvasses with equal power and mystery. The intimate dimensions of Morandi’s works and the allusions to everyday domesticity and private space can be traced back to Chardin and, to some extent, Rembrandt. 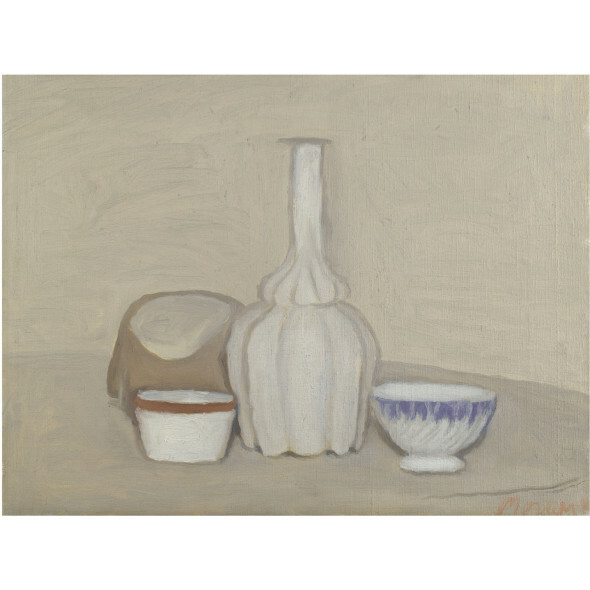 Giorgio Morandi absorbed these national and international influences, combining them in a very personal style, appearing for the first time in the early 1920s. During the same decade, he began to exhibit nationally, where he found initial success with collectors and critics alike. With his 1939 exhibitions he achieved the unquestionable reputation as a 20th century Italian master. In 1948 he won a prize at the Venice Biennale for his Metaphysical works, and in the same year he was “discovered” on the international market. Although personally Morandi never travelled further than Winterthur, his art locates itself in a broad European tradition, and shows the influence of French, Dutch, German, British and American painting. Giorgio Morandi is often thought of as a painter of bottles, jars and other domestic objects. A still life with a pitcher, some boxes and a garlic-shaped bottle is what often comes to mind when thinking of the artist. Spanning fifty years of his career, Morandi produced more than 800 still lifes, achieving an ever more refined harmony in composition and in chromatic tones. By depicting domestic objects such as bowls and bottles, the artist alludes to those spaces of the house that are quintessentially intimate. In this way he leaves aside the “heavy furniture made of dark wood” that could be found in living rooms and instead focuses on the most authentic aspects of people’s life. This adds a sense of curiosity to the paintings as the viewer is brought to believe that the meaning of the image is more complex and can only truly be found through lengthy contemplation. It is probably this invocation of depth, read as spiritual profoundness that has encouraged the myth of Morandi the ascetic hermit. It is also this association of Morandi to intellectualism that explains the appearance of three still lives in Fellini’s La Dolce Vita and Antonioni’s La Notte. Morandi’s output from the 1940s produced some of his most iconic works. In those years Morandi achieved the balance of composition and the refined tonal qualities that both critics and the public associate to his name. In the present Still Life, one of the finest, both these characteristics can be found. The whole scene is surrounded by a dazzling mysterious light, as if the sunrays of a summer morning illuminated the objects filtering through a white linen curtain. The iconic garlic-shaped bottle is placed at the centre of the symmetrical composition. On its right, stands a violet-and-white bowl; whilst on its left there is a white bowl with a reddish brown rim and, in the background, a copper pan. The latter, the same appearing in the Still Life from 1941 exhibited nearby, is a rather recurrent object in the paintings produced in 1946. This particular Still Life stands out for its extremely delicate tonal qualities. The work is a magnificent example of Morandi’s use of positional tones: in it, each colour corresponds to a point in space. The whites describing the ensemble of objects on the table become more and more brilliant towards the foreground. On the small bowl on the right, for example, it is possible to see some thick brushstrokes of extremely pure colour. On the contrary, they become progressively muted towards the background, where they transform into an almost dirty, greyish yellow ochre. Morandi matured such a use of positional tones in his etchings, later adopting it also for his paintings. The artwork described above is subject to changes in availability and price without prior notice. Where applicable ARR will be added.